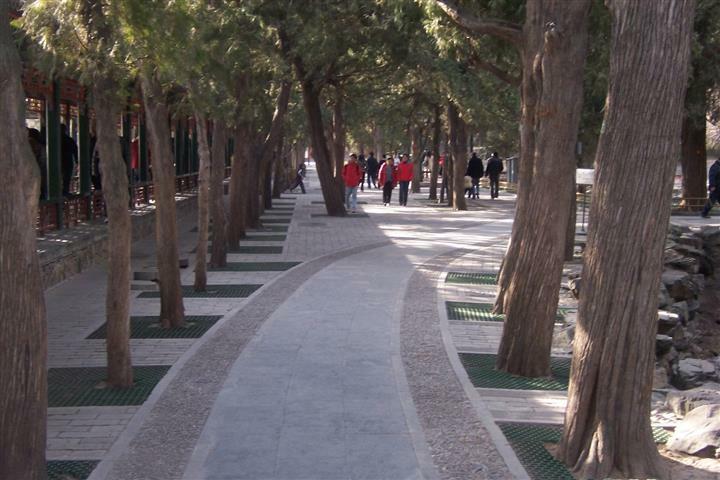 A pedestrian walkway constructed of poured concrete with good edge-definition provided using small stones set in a concrete border on each side of the walkway. The border provides both colour and texture contrast. A direct and accessible path of travel should lead from all public transit stops, vehicle drop-off and pick-up locations and public sidewalks leading to the main entrance of a building. Additionally, pedestrian sidewalks and pathways within a property should be designed to be accessible to everyone, including people impacted by blindness. Accessible parking spaces should be located adjacent to a walkway leading to an accessible building entrance. To ensure pedestrian safety, paths of travel should be distinctly marked and separated physically from vehicular traffic. They should not require pedestrians to navigate large open expanses where vehicles are in motion. Pedestrians should not have to pass behind vehicles that may be backing out, unloading goods or dropping off/picking up passengers. If a pedestrian path of travel is next to such an area, place a fence or landscaped barrier between the walkway and the loading or drop-off area. Directional TWSIs or textural contrasts in ground materials, detectable by a long cane and underfoot, should be considered to guide individuals along safe pedestrian routes. Further information can be found in the section Tactile Walking Surface Indicators.